If we could provide 500 million farmers in Sub-Saharan Africa with access to adequate storage systems for their crops, what result would we see? According to Jordan Dey of GrainPro, this one provision could very likely change the world. Part of this end result would also stem from the fact that more of these farmers’ crops would make it to markets, boosting the world’s food supply so there’s enough to reach those suffering from hunger. As we have pointed out on this blog before, post-harvest loss is a major issue in SSA countries, with the FAO estimating that 37 percent of food grown in the region is lost between production and consumption. Part of the reason this figure is so high is due to the fact that many farmers are not able to store their crops after harvest. GrainPro is a social enterprise that aims to combat this issue by improving food security around the world, particularly for small farmers, through the provision of advanced storage solutions. The company’s roots in Africa date back to 1992, and they now have offices in Kenya, Uganda, Ethiopia, Nigeria, and Zimbabwe, with independent distributors in 20 other African countries. GrainPro also works in Asia and Latin America. 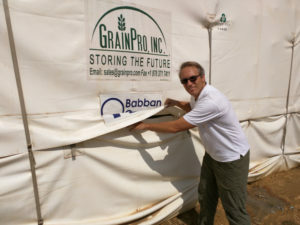 GrainPro works with smallholder farmers, often in partnership with governments, foundations, and large NGOs like the United Nations, to provide airtight, or hermetic, storage systems. 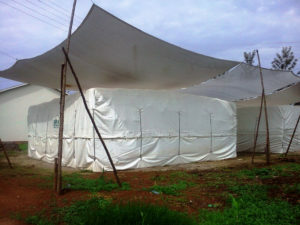 These storage systems allow farmers to store their crops for long periods of time without risking degradation of quality. By allowing farmers to safely store food, GrainPro helps to ensure that farmers can reap the financial rewards of selling their crops at market, which leads to increased incomes and healthier outcomes. GrainPro’s storage solutions also help farmers to prevent contamination of aflatoxin, a cancer-causing mold that can grow on post-harvest crops that are not being stored appropriately. Dey said GrainPro is currently working to make its products more widely available in rural areas in order to reach more farmers. “The “last-mile” challenges in Africa, Asia and Latin America are very real, but they can be overcome with a smart strategy, the right partnerships, new technologies, and financing,” he said. 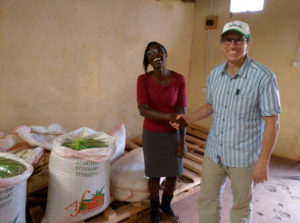 Currently, the World Food Bank has plans to use GrainPro’s hermetic storage bags at our farm sites in Uganda to store our grains upon harvest this year. To learn more about GrainPro, visit their website. Meet the Team: Dr. Tana Juko, Senior Research Associate	Check out our CEO on the TedX Stage!